I've always bought my eyeglasses from the local optometrist or ophthalmologist. I like to support local businesses and it doesn't take a math genius to work out that there's no way an independent eye doctor could sustain a business on exams alone. There's just too much expensive equipment they have to have. I don't want my only eye doctor options to be Walmart and Target, which is what will happen if the local doctors can't make a go of it. So I try to do my part. Last month I got an exam and new glasses from my local doctor. The frames were not terribly fancy and because my eyesight isn't too bad, I didn't have to get a whole bunch of expensive options, other than progressive lenses (near vision – a casualty of middle age). Even so, the glasses cost almost $500! That's a serious chunk of change. I also wanted some prescription sunglasses. But I'm not going to buy $1000 worth of eyeglasses in one go. I'm just not. So I got my prescription and ordered them online. I figured I'd done my part by buying my regular glasses from the local doctor and he wasn't "losing the business" for my sunglasses because he was never going to get that business. I would have gone without prescription sunglasses if I had to pay another $500 for them. So I gave that business to Zenni Optical. There are several online eyeglass retailers. I chose Zenni because Consumer Reports liked them. 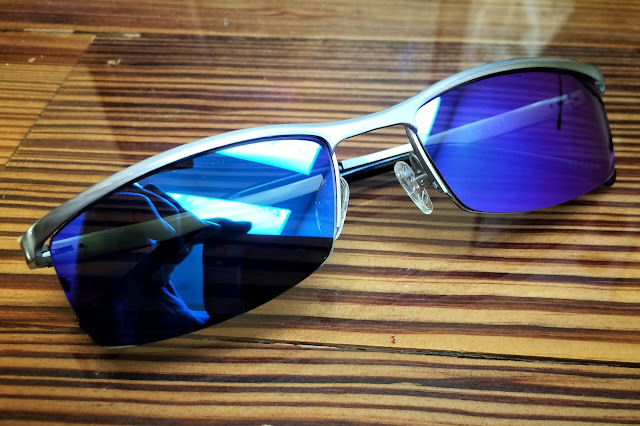 I paid $120 for titanium half-rim frames and polarized, progressive lenses with an 80% gray tint and blue mirror finish. That's a tremendous deal compared to what I'm used to paying for eyeglasses. I could buy 4 of them for what I'd pay for a single pair at my doctor. I can see why people go this route for all their eye-wear, although I won't for reasons I've already stated. Obviously you have to get your prescription from your doctor and enter it accurately into the web site. Do not screw that up because the result will be useless eyeglasses! It's not required, but I think it helps if you know what the numbers on your prescription mean. You might need to measure your pupillary distance (in mm) if it wasn't included in your prescription (mine wasn't). This is an important measurement, but pretty easy to do. At the doctor's office, they use a fancy machine which is very accurate. But the manual method you do at home involves placing a ruler over your eyes. A millimeter is really small so the margin of error is fairly significant when you're measuring manually with a ruler. Therefore, it's important to measure it multiple times and get as accurate a measurement as you can. Alternatively, you can download a phone app that measures using the camera, but I can't say one way or the other how accurate these apps are. You'll need to measure the total width (in mm) of your current frames, including any lugs that stick out from the sides. Assuming your current glasses fit well, you'll want the total width of any new frames you choose to be within 2-3 mm of your current frames. You'll want to get the lens width, bridge length, and temple arm length from the frames as well. Fortunately these 3 dimensions should be written on the frame itself, usually on the inside of one of the temple arms. Your new frames need to have a temple arm length within 2-3 mm of your current frames, and the bridge length within 2 mm. I don't think the lens width matters as much as long as the overall frame length is right. Zenni's web site has a neat feature that allows you to upload a photo of yourself which it will overlay with an image of your selected frames so your can see how the frames look on your face, but this is not adequate for proper sizing. You need to do the measurements. The process is not for everybody. I couldn't see my mother going through all this trouble for instance. But if you're willing to educate yourself and put in a little extra effort, you can save a lot of money and mitigate much of the risk associated with buying glasses online. So, how are the glasses? My first impressions of my Zenni glasses are very positive. They seem very well made – about on par with what I'd get from my eye doctor. With the titanium frames, they're tough but lightweight. And the prescription lenses seem right on the money. They fit fine out the box, which I was pleasantly surprised by. And the tint is perfect. The included case is not as fancy as what I'd get from my doctor, but it's adequate. I won't know about durability for quite some time, but they certainly made a good first impression. Of course, the downside with online glasses is after-purchase support. If the glasses had needed adjustment, I would have had to do it myself. Zenni's web site provides instructions on how to do it. I suppose I could have asked (and probably paid) my local doctor to do it, but that would be classless in my opinion. I would have just done it myself. It's not hard. If the prescription wasn't right, I would have had to deal with Zenni's return policy, which I highly recommend you read thoroughly before buying. The policy is not unreasonable in my opinion, but it's probably not nearly as forgiving as your local doctor's. Speaking for myself, at 25% of the price, it was well worth the risk. I think I'm going to be sticking with my habit of buying one set of glasses from my local doctor. But this has been a positive enough experience that sunglasses and backup glasses are probably going to come from an online retailer from here on out.